The new product from Honda is the Activa-i, which is the low cost version of their popular scooter, the Activa. It has been priced at Rs. 44,200 (ex-showroom Delhi) and is the cheapest automatic scooter available in the country. 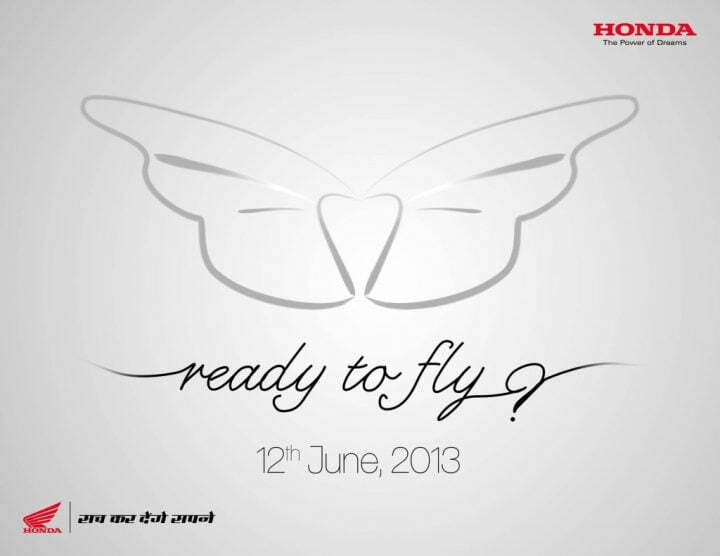 Honda has teased the launch of a new bike/scooter, which will be launched on 12th June 2013. Honda Motorcycles and Scooters India (HMSI) has been on a roll the past few months. It launched two new bikes, the 110 cc Dream Neo and the 150 cc CB Trigger. In May 2013, its sales grew by 16% as compared to May 2012 with a total of 4,88,566 units sold. This rise in sales is at a time when other bike manufacturers are not doing so well, and Honda does not want the good times to end any time soon. It is getting aggressive; there will be more launches in the coming months and the company is also preparing itself for increased demand of its vehicles. There is speculation that Honda might be launching a new scooter, and names such as ‘Activa-i’ are doing the rounds of the interweb. Seems to us that the new launch could be a bike, rather than a scooter (the ‘butterfly’s body looks like the tank of a bike) but lets not get ahead of ourselves here. Car Blog India has been invited to the event and will be bringing live updates. Also stay tuned for a walk-around video, prices, and features that the new bike/scooter will get.